eCut 6 - Help. Contour cutting - manual mode. Contour cutting - manual mode. This article will be addressed to all holders of cutting plotters, except those, who has automatic contour cutting function. The main objective is the combination of the printed image and contours (which must be cutted on the printed image). Well, who thinks that it is very simple - it is not always assured - very often print comes with linear distortion on all axes - for example, if you sending rectangle , the output can be trapezoid - and this distortion must be corrected. In fact, this task is performed not by eCut. eCom makes it - secondary program that worked through com port - but new version of this program can connect to plotter not only through com port , but also through printer driver installed in your system. Well enough theory - go to practice. Now I will tell you how to prepare files for printing and cutting . As well as how to prepare a file for cutting if the seal has already been done ( there are some subtleties ) . And then I'll show how eCom works. Print - printed crop marks. Cut - cutted crop marks. Fit - combination of print and cut objects. Laser fit points - point in cropmark that must fit cutting corner. On an example of perfectly clear that cutting edge (corners red dots ) coincide with the characteristic points on the seal .. Placing the printed material . 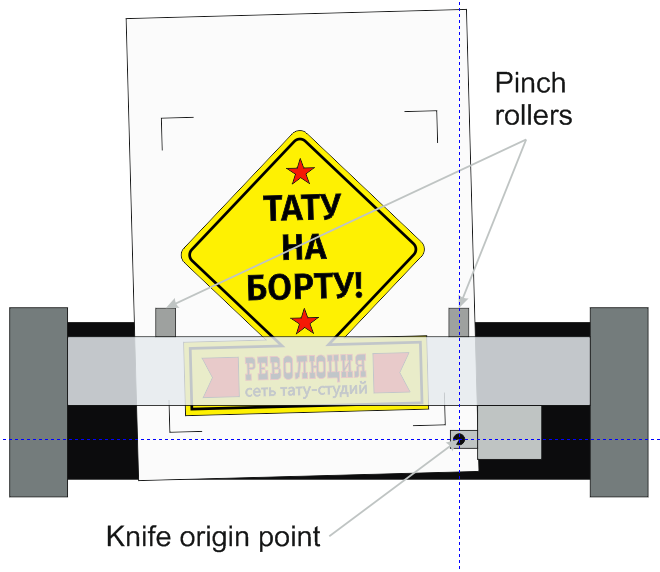 The material should be placed in the plotter so that all printed objects must be in the cutting area , and the most proximal crop mark must be near (1cm) origin. By guide lines seen that all the objects ( including the crop marks) lie in the plotter cutting are - i.e. to the left of and above the initial point. Once the material is placed , set the plotter to receive data (if necessary) and open the file of contour cutting . Everything is as usual with one small BUT - do not click Print, click on little array near Print button and select "Contour cutting with manual positioning." If you do not see this button - click right mouse button on "Print" button and you'll get it. After pressing , eCut do its work and eCom will start. 1. You can just click on the arrow. 2. You can use keyboard arrrows. 3. You can poke the mouse on the image , if the crop mark is within 2cm from the point . In a few words that have to do now - after pressing the START button , you will need to provide the nearest reference point - a point number one. Bypass points is clockwise . Further, clicking "Set CropMark # 1" plotter goes to the second control point - it also needs to fit , confirm by pressing the "Set CropMark # 2 " and so on up to the fourth point. After pressing the "Set CropMark # 4 and start" plotter returns to the origin and begin cutting considering distortion. Если у вашего плоттера есть лазерная указка, и ее оффсет можно указать в настройках самого плоттера, то все это нужно проделать включив режим лазерной указки (как правило на панели плоттера есть соответствующая кнопка) и подгонять нужно не ножиком, а лазером - так конечно же удобнее. If your plotter has a laser pointer, and its offset can be specified in the settings of the plotter , all this needs to be done by turning on the laser pointer (usually panel plotter has a corresponding button). Through trial and error , these parameters must be chosen . Here 's what you need to remember - this offset you have to specify in plotter points - usually it is 40 points per 1 mm , but not always. Well, actually , that's all. If you have questions / suggestions - write, discuss .